Josh Tatum ’03 was so torn between potential careers as an attorney or in religious studies that he went to graduate school for both. That journey and theological reflections that led him to see the practice of law as his God-given vocation made Tatum, an appellate attorney with Indianapolis firm Plews Shadley Racher & Braun, an ideal choice to be the first speaker for the College’s “Callings” program. A collaboration between Associate Professor of Religion Jon Baer and Assistant Director of Career Services James Jeffries, “Callings” is an effort to help students reflect on the notion of calling or vocation as they shape their future plans. 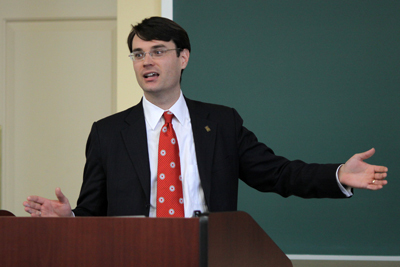 During his talk, “Sinning Boldly: One Lutheran Lawyer's Trials in Discerning and Answering His Call,” Tatum explained his decision to simultaneously pursue a master’s of divinity and law degree at Vanderbilt University. As a Lutheran, he embraced Martin Luther’s divergence from the Catholicism of his day that held that those with Holy orders were the only individuals called to a particular vocation. In his junior year at Wabash, Tatum was trying to decide between the law and religious studies. He went to Professors John Fischer H’70 and Bob Royalty for advice. Both professors had the same solution: Do both. Tatum enrolled in the J.D./M.Div joint degree program at Vanderbilt. During his Wabash days and before, Tatum had participated in summer programs for those considering the pastorate. His reflection at Vanderbilt led him to realize that his calling was to the law. “I had learned that I could be a good pastor, but something wasn’t clicking for me,” he said. His decision to pursue his law degree led him to work with men who became formative in his life, including former Indiana Chief Justice Randall T. Shepard, for whom he clerked from 2008 to 2009. He counts Shepard—along with Brian Hewitt and Wabash Professor Ed McLean H’03—as “saints” in his life. That’s the very notion behind the Callings program, which Tatum is enthusiastic about to the point of seeing it as part of the College’s responsibility. Add to that the fact that the late Wabash Professor Bill Placher ’70 literally wrote the book on the subject: His Callings: Twenty Centuries of Christian Wisdom on Vocation was named a Top 10 book of the year when it was published in 2005. Tatum is pleased to see the work continuing.